In art, the product sometimes overshadows the process. 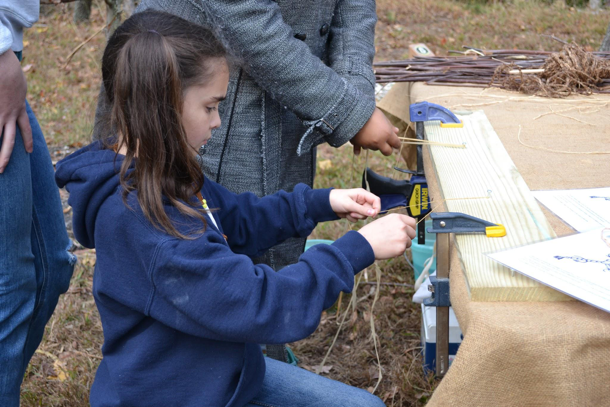 As a way to make the product the process, the Village Manager and Educator at Jefferson Patterson Park and Museum (JPPM) developed an idea of building an art project through a series of event activities that also integrated technology used by people over 500 hundred years ago. This is an event that JPPM puts on every November as part of American Indian Heritage month. 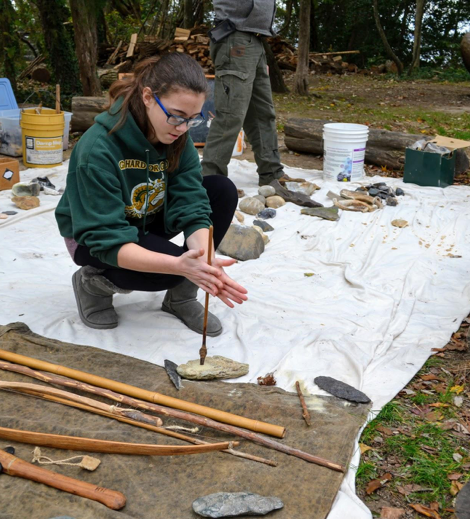 Over the course of the day, the goal is for participants and visitors to walk away with a better understanding of the history and culture of Native Americans in Maryland through hands-on activities and demonstrations. 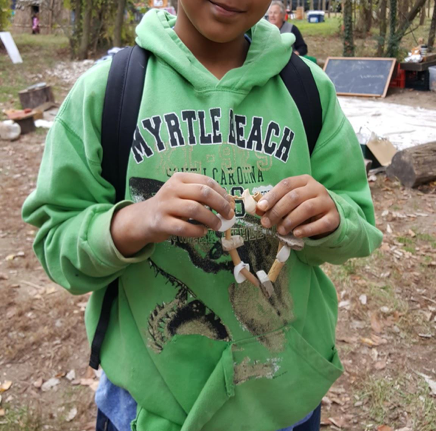 During the most recent heritage day, participants had the chance to create different types of beads (stone, bone, shell, etc.) by using technology used by Native Americans before colonial influences. The final step was to create a piece of string from natural materials in order to create a necklace or bracelet. Instruction on how to make the string was also part of the process. There were only four different types of beads to make but participants could design their necklace and beads however they wanted. The individual differences showed how each participant interpreted their experience throughout the day… As well as their personal connections to their project. These were a major part of this process. This was evident in the broken bits of material left behind and the multiple attempts at creating some of the more difficult beads. 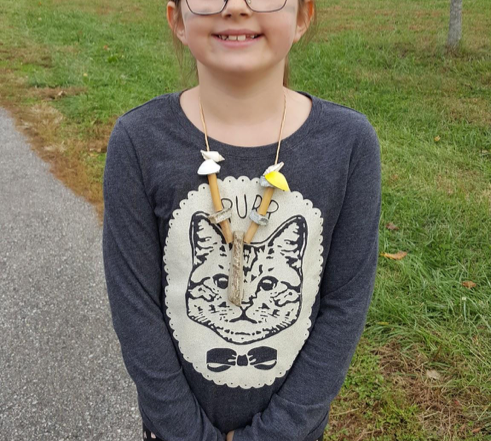 For some of the younger visitors, we had beads that were mostly finished with just some minor alterations necessary on hand. A major concern was making sure everyone had some product that they had a hand in making. Four different methods were used to make the beads from different materials. For the stone beads, we used soapstone because of how easy it is to drill through. Participants used a stone-tipped drill and rolled it in their hands, pressing down in order to form a hole in the center of pre-cut pieces of stone. Since soapstone is so soft, they could then sand the edges into a more circular, square, or even a heart-shape bead. During the process of drilling the hole, if there was too much pressure applied, the participants’ beads broke in half. Some pieces of stone were very thick and required additional time and patience to drill the hole. 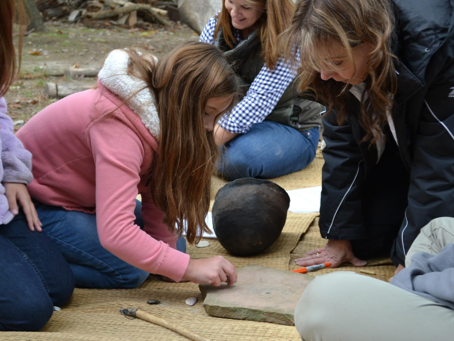 Overall, many participants had success using the stone-tipped drill to make their holes and thus their beads. Bone beads were made from dried river cane. We did this instead of actual animal bones for the ease of access and cleanliness. Both bone and river cane are hollow, making it similar to work with. The dried river cane was scored using a sharp piece of stone. Then once it was mostly cut through, participants could simply split the end of the stick off to have a hollow bead. The ends were sanded down on a large, coarse stone to file off any splitting ends. The main difficulty with the “bone” beads was the thickness of the river cane. Although hollow, some of the pieces had thick walls making the scoring process longer. Shell beads were made from small snail shells by simply grinding one side on a coarse stone. This process slowly wears away the material to make a hole. We included only one type of metal bead for this program to keep with locally sourced materials. (Metal was not an available resource for Native Americans until colonists brought that technology.) To demonstrate this factor, participants could only get a copper bead from one vendor stand at the event. In order to receive a copper bead, they had to share something with the vendor. This could be an answer to a question or something the participant had learned throughout the day. In return, the vendor gave them an already flattened piece of copper with a hole punched in it for the participants to add to their necklace/bracelet. Gaining this copper bead mimicked a trade process. Finally, participants needed string to put all of their beads together to make a piece of jewelry. They twisted pieces of raffia together to make a natural piece of cordage using the plant fibers. Dogbane (also called Indian Hemp) is a type of plant that had fibrous bark commonly used to make ropes and nets. Demonstrators were showing how to use dogbane to make string similar to the pieces they were making out of raffia. Once the participants had their string, they could complete the process and make a piece of jewelry. The product they had been working on all day. The activity of gradually making a piece of art is important in helping children understand what makes something valuable. When we think about our own culture, many place value on different aspects of material items for various reasons. A large part of what makes something valuable is the process of creating it. Throughout the day, the participants in this event were able to get a better sense of this concept. They learned about a life where one could not just buy what was wanted or needed. 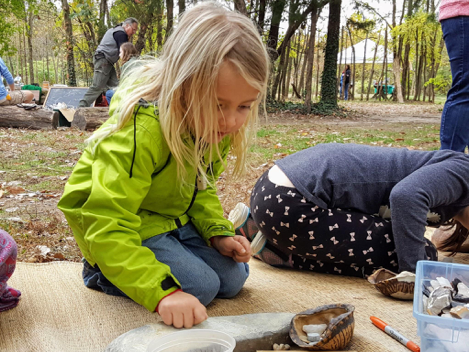 Working with natural materials and using stone tools to create a piece of wearable art, they can be proud of giving the time devoted to creating it. Participant making cordage to string together beads.